A wider window into Central Oregon’s rich history is now on display after the unveiling of the Bowman Museum expansion in Prineville, which has seen the facility double in size after several years of planning and fundraising campaigning. The new wing on North Main Street is providing a home to evolving new permanent interactive exhibits telling Crook County’s story of timber, homesteading and ranching, including a spotlight on local entrepreneurial legend Les Schwab, and a Western Heritage Gallery. Flex space also increases the museum’s ability to host travelling exhibits, and a roomier open area with a “potbelly stove” atmosphere will allow visitors to enjoy historical re-enactments, an expanded lecture series and family-focused oral histories. 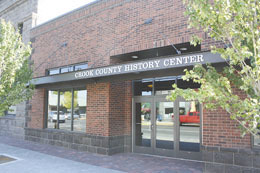 The new 5,000 square foot annex has relieved somewhat cramped conditions in the old Crook County Bank building site of the museum next door, which through generous public and private support amassed a vivid collection of pioneer history and organized programs serving more than 10,000 annually, with a steady stream of people thronging its creaky staircases, old vault and teller areas and peering into glass case exhibits bringing the Old West to life. The museum had been housed in the former bank since the landmark building was donated by the A.R. Bowman family to boost the Historical Society’s preservation and heritage promotion efforts in 1971. A Kansas City native, civic leader Arthur Ray Bowman served as Crook County Judge and promoted initiatives creating the Ochoco Irrigation District, the Prineville Airport, U.S. Highway 26, and the Crooked River Project, which today includes the A.R. Bowman Dam. In 1991 the museum building was entered on the National Register of Historic Places. In 1996 it hosted the first Smithsonian exhibit in Central Oregon, and in 1997 it won national recognition from the Institute of Museum Services. Today the Bowman Museum publishes books and field guides, presents lecture series, conducts historical field trips and through the internet links its collection with museums and libraries worldwide, as well as hosting thousands of students, visitors and scholars each year. With the old facility straining at the seams, when the adjoining property – two former retail storefronts owned by the Simmons family – became available a few years ago, the catalyst was created for a coordinated effort to raise money to cover potential acquisition, renovation and new exhibit costs for a much-needed expansion. Gillespie spearheaded the close to $2 million Let’s Make History capital campaign under the auspices of the museum’s operator, Crook County Historical Society, which was founded over 40 years ago to preserve and promote understanding of the region’s past. The campaign committee also took much input from the community in molding the look and feel of the addition, which complements and harmonizes with the adjoining existing building. Gillespie said that the museum had benefited from numerous sources of funding, including the Historical Society, grants – of which 20 out of 30 applications were landed – corporations and many individual contributions. The initial budget was around $1.8 million, but a final push is underway to cover costs for the new permanent exhibits. Gillespie said that the figures were constantly changing, but the response from the community had been “amazing”, especially in light of the recent turbulent economic conditions. In what was once dubbed the “Ponderosa Pine Capital of the World”, displays include the honoring of a way of life that has involved and sustained many families in Crook County, as well as helping newcomers and tourists understand how timber helped build Prineville. Other major features of the expansion include a research library – including burgeoning genealogy resources – a collections care area, a raised stage, and a community room. There is also climate controlled space for archives, offices and storage. Gillespie also said that all concerned wanted to make sure they had a good-sized community room, which now seats 150 and enables accommodation of special speakers, meetings or other bigger events which previously had to be held off-site. State-of-the art audio-visual equipment has also been installed to enhance lecture and interactive experiences. An agriculture exhibit that represents farmers and ranchers is envisaged to give visitors a sense of pride and respect for the county’s ranching, farming, and Native American heritage, with stories also depicted in the “Western Heritage” enclave. Gillespie projects that use of the museum’s library will nearly double to more than 1,000 annual visits, that student participation can be boosted to 2,200 each year, and that more than 13,000 community members and tourists will visit annually. He also paid tribute to the construction and design team that included SunWest Builders and Steel and Associates Architects, for their creativity and efficiency throughout the project’s process. Project Manager Wayne Powderly, of SunWest, said there were some interesting challenges during the project, including negotiating through thick basalt fronted rock walls of the vintage building and the discovery of old fuel tanks in the rubble, which had to be dismantled and disposed of in accordance with DEQ guidelines. Another unexpected find during early construction was the discovery of two time capsules dating to around 1956 that had been buried in one of the addition area’s columns. A fascinated crowd gathered earlier this year to open the capsules, which contained everything from newspaper clippings to Japanese money to cigars, with the contents now put in display cases for everyone to see. Scott Steele, principal of Steel and Associates, said, “We really enjoyed collaborating with the client team to design a remodel and new façade that has been so well received by the community. “The new façade includes a mix of native volcanic tuff stone, which was hand shaped into units of a size and texture similar to the courthouse, and a rich blend of brick. “I believe we achieved multiple community goals with the design including beautifying the street, creating a complimentary contextually responsive façade, and providing the Bowman Museum with much needed exhibit and meeting space to help preserve and convey the history of Crook County. The Steele Associates design team on the project included Jeff Wellman, Steve Olson, Emily Freed, Matt Appleby and Scott Steele.